Home Jurassic World: Alive JWA: Recipes for ALL Hybrids! What DNA do you need? JWA: Recipes for ALL Hybrids! What DNA do you need? Like any Explorer, there comes a point where you need or want to fuse Dinosaurs’ DNA together in order to create Hybrids. All Legendary and Unique Dinosaurs are strictly Hybrids, and sadly cannot be found in the wild. In addition, most of the Epic Dinosaurs, while they can be found in the wild, are also Hybrids and therefore one can fuse two Dinos’ DNA together to create DNA for them. With that being said, the MetaHub has gathered the data to provide you with the recipes for all the Hybrids currently available in the game! 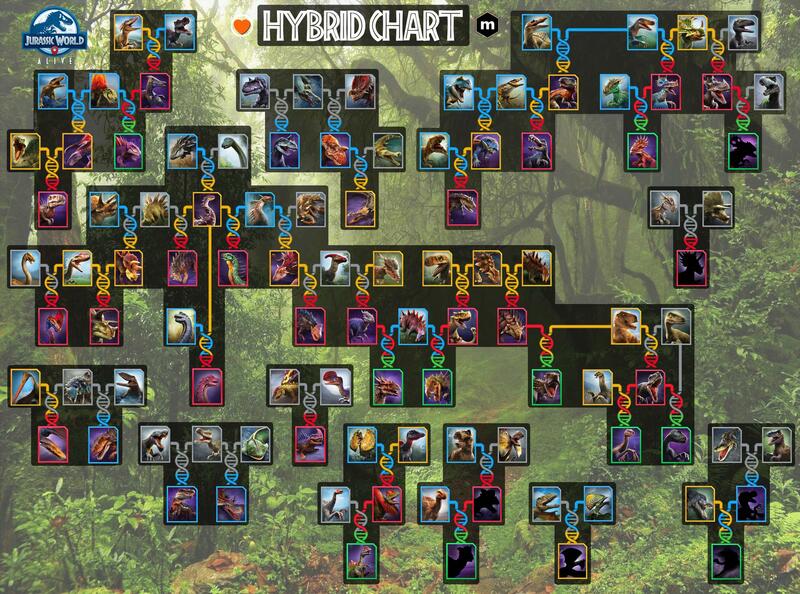 Special HUGE hanks to Orange Heart from our Discord Server who updated and revamped the Hybrid Chart to help you visualize all the potential Hybrids available in the game as of 1.5! “Boon? This is it?” Well, yes. This article is meant to provide a quick guide of all recipes for all Hybrids currently available in the game. Worry not, we’ll keep it up to date! I just noticed 2 minor errors in the list? Parasaurolophus only need 200 DNA in this list for fusing into Paramoloch, since Parasaurolophus is a common should it not be 500 DNA instead? Megalosaurus only need 50 DNA in this list for fusing into Megalosuchus, sice Megalosarus is a rare should it not be 200 DNA instead? Anyways great guide and keep up with the awesome posts, news and guides on this site! love it! Both of these are correct and need to be updated please.